An authentic Puerto Rican recipe for pinchos. Cut the chicken thighs into 1 inch cubes and place them into a gallon-sized zip-top bag. Season the chicken with the adobo, Sazon, oregano and olive oil. Seal the bag and refrigerate the chicken for at least 1 hour, but preferably overnight. 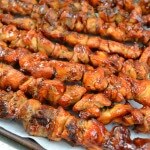 Thread the chicken onto the skewers, making sure that the chicken is packed snuggly, but not too tightly. Heat your grill to medium heat, and lay the pinchos in a single layer along the grates. Grill the pinchos for 10-15 minutes, until the chicken is golden brown and thoroughly cooked. When the pinchos are cooked, slather them with your favorite BBQ sauce. Serve with some crusty bread slices, or fried plantains. If using bamboo skewers, soak them in water for at least 1 hour before using them. This will keep them from burning up on the grill.